The Leave and Remain campaigns defined British ‘greatness’ in very different ways. The referendum reflects more than attitudes toward EU membership — it marks a new understanding of Britain’s role in the world, argues Benjamin Martill (LSE). The end of the postwar consensus of liberal internationalism has important implications and needs to be taken seriously. The ‘Great’ in Great Britain is a geographical term identifying it as the larger of the two Britains – the other being Brittany in France, once known as Britannia minor. But this is not the way many Brits interpret the term. For greatness has also become a political category, referring not to British territory but to its venerable national attributes and its reputation on the international stage. What, we are often asked, makes Britain ‘great’? Formerly this question might have been limited to the tabloid press and nostalgic television programmes. But in the age of rising populism across the globe and the election of Donald Trump as American president – on the promise of ‘Making America Great Again’ – the question has begun to take on more explicitly political qualities. Increasingly, individuals are asking what it means to be a ‘great’ power, what kind of actions ‘greatness’ requires, and how – or whether – to ‘Make Britain Great Again’. Nowhere was this emerging politics of ‘greatness’ more evident than in the referendum campaign over Britain’s EU membership in 2016. For Brexit was about more than Britain’s relationship with Europe. The arguments (successfully) used by the Leave campaign critiqued not just the EU but also the broader liberal consensus in British foreign policymaking on which British accession had, in part, been premised. Moreover, the position on which the Leave campaign based its opposition to the EU was remarkably consistent in its views of Britain’s role in the world. The Britain they sought would be a great, global free-trading nation, once freed of the shackles of EU membership. For “Britain needs fundamental change so that we can control our borders, trade freely around the world and return power to Parliament to block harmful EU rules” (Conservatives for Britain 2016). The UK put its own citizens first, instead of subsidising or otherwise trying to change other countries. As one Grassroots Out leaflet complained: “How about we take care of our own problems first, and leave [sic] EU” (Grassroots Out 2016). And an independent Britain would cease to provoke conflict, especially with Russia, which the EU was accused of doing. UKIP, for instance, noted that the EU “failed in Yugoslavia [and] provoked a war in Ukraine” (UKIP 2016). Above all, the leave campaign stressed one important message: Brexit was about “putting the ‘Great’ back into Great Britain” (UKIP 2017). In short, post-Brexit, Britain would “re-join the rest of the world” (Brazier 2016). The Remain campaign saw things very differently. This is not to say they didn’t believe in Britain as a ‘great’ power. 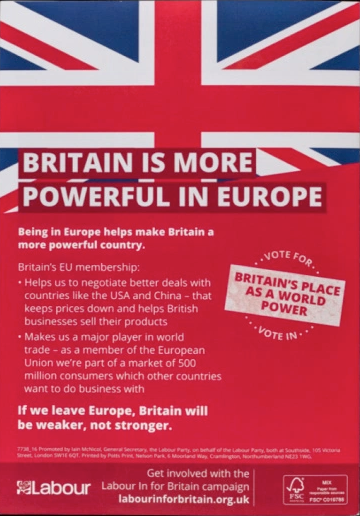 Indeed, even the Labour remain campaign argued that “Britain is more powerful in Europe… If we leave Europe, Britain will be weaker, not stronger” and exhorted their supporters to “Vote for Britain’s place as a world power” (Labour In for Britain 2016). The difference was that the Leave campaign viewed the requirements of greatness very differently than the Remain camp did. They saw Britain’s greatness as a product of its commitment to a regulated and legalised international order and its membership of a dense network of overlapping institutions, of which the EU was but one example. “Britain is a member of more international organisations than any other country”, noted the European Movement. “We sit at all the top tables; UN, NATO, EU, Commonwealth, G8, IMF, World Bank, etc., and we are able to use our unique network to influence the course of world events” (European Movement 2016). Remainers associated greatness with the promotion of British values – democracy, human rights, rule of law – rather than the demonstration of British power. Moreover, remain supporters regarded the EU as an enabler, not a constraint, in this regard, since British membership had an amplifying effect on the UK’s political, economic and military clout. As Lyn Brown, a Labour MP remarked: “Britain is more prosperous, better protected and more powerful in the modern world because of our membership of the EU… Britain’s EU membership gives us a strong voice on the world stage” (Brown 2016). Maintaining Britain’s EU membership, as a result, was about “Keeping Britain Great” (European Movement 2016). The prominence in the campaign of Britain’s role in the world matters, because it signals the politicisation of a policy domain hitherto marked by consensus rather than conflict. Since 1945 the dominant discourse underpinning the conduct of the UK’s foreign relations has been that of liberal internationalism, in its various guises. One aspect of this could be found in the UK’s support for the establishment of a global free-trading regime and on institutions to regulate international order and ‘restrain’ anarchy. Another element was the British contribution to the collective security of ‘the West’ against its various authoritarian and illiberal enemies. Moreover, there was also a key normative element, with British ‘greatness’ thought to reside in its promotion of liberal values across the globe, from human rights and democracy to economic liberalisation and the rule of law. Liberal internationalism found support across diverse political constituencies, especially the Labour right, Conservative moderates and the Liberals (and subsequently Liberal Democrats), such that a ‘postwar consensus’ was said to exist between the parties. Opposition to liberal internationalism did emerge from time to time, of course, and from within specific constituencies, most notably the traditionalist wing of the Conservative party. When it did, moreover, it followed a familiar pattern associated with support for old-school realpolitik, emphasising political independence, the balance of power, and a narrow definition of the national interest. And yet these views were never sufficient to unseat liberal internationalism as the dominant discourse animating Britain’s global role. Fast-forward to 2016 and this political situation had changed considerably. The political centre-ground upon which the post-war consensus was based had collapsed. The Conservative party clung to power by aping the policies of its UKIP challengers on the right, heralding a return to a more virulent Eurosceptic position and putting more traditional members in the driving seat. Under Jeremy Corbyn, the Labour party moved away from the centrism of the Blair years. The Liberal Democrats, meanwhile, saw a precipitous drop in support after propping up David Cameron’s coalition government, widely blamed for the damaging post-recession austerity policies. These factors culminated in the rise of an alternative realist narrative of Britain’s role in the world and, ultimately, to the game-changing vote to leave the EU in the 23 June referendum. The victory of the Leave campaign lent further support to the narrative of a great, global Britain, especially once it became clear Theresa May interpreted the result as a mandate for a ‘hard Brexit’. In language reminiscent of UKIP priorities, May called in her Lancaster House speech for a “great global trading nation” (May 2017). The Conservatives’ appropriation of the UKIP position did not go unnoticed. Nigel Farage, for one, said he could “hardly believe that the PM is now using the phrases and words that I’ve been mocked for using for years” (Farage 2017). The politicisation of British foreign policy is one of the lesser-studied aspects of the Brexit vote, but it deserves to be taken seriously, not least because it challenges the expectations of scholars and policy-makers alike that British foreign policy after Brexit will see the continuation of liberal internationalism without the EU connection. Since opposition to the EU was based, in part, on opposition to liberal internationalism, this discourse has also fallen from favour in the post-Brexit fallout, at least as far as the presently ascendant Brexiters are concerned. This ideational shift needs to be taken seriously. Discourses are not just empty rhetoric. They give politicians and policymakers representations of the world which inform their identification of problems, priorities and appropriate solutions. And they foreclose some policy options whilst opening-up others. The politicisation of Britain’s foreign policy agenda – built upon institutionalisation, trading-regimes, democratisation, foreign aid, and ‘Western’ deterrence – means these categories cannot be taken for granted in the years to come. We need to acknowledge this challenge to liberal internationalism if we are to fully understand future debates, and changes, in UK foreign policy, for Brexit is about much more than Britain’s EU membership. This post represents the views of the author and not those of the Brexit blog, nor the LSE. 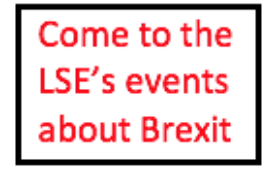 It first appeared at the UCL Brexit blog. 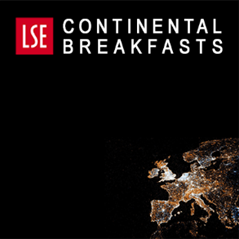 Dr Benjamin Martill is a Dahrendorf Fellow on the project Europe After Brexit at LSE Ideas and a Research Associate at the UCL European Institute. It is intriguing how the two great post-War “liberal internationalist” powers, the US and the UK, have suddenly become two of the strongest opponents of the international order they were central in establishing. We now have paradoxes like China supporting, and the US opposing, international attempts to combat climate change. We have the UK wanting to leave the EU Single Market, which it was the foremost architect of in the first place. There is a deep-seated fear in both the US and UK that a new multi-polar world is emerging in which the US and UK are being left behind. Maybe they should think of “Our Nation First” like other great powers at the moment (think Russia, China, India). My personal opinion is that this short-term panic is unnecessary. The US and UK should continue to put faith in the many multilateral institutions which have emerged since the Second World War, and which in many cases they helped to create. In its foreign policy dimension, Brexit wasn’t so much about seeking ‘greatness’ as about seeking to end a humiliation. Thus the Remain campaign’s demand was that the electorate accepts this status quo of humiliation; Leave offered hope of an escape from it. It’s possible to over-generalise and over-interpret this electoral assertion that Britain could stand on its own two feet.